Smelly feet are common in both children and adults who wear closed shoes daily, according to the American College of Foot and Ankle Surgeons. A year-round condition, foot odor might be caused by bacteria or fungus in your shoes. In some cases, the bacteria feed on the top layer of your skin, which produces the smelly odor, states the ACFAS. But you're not doomed to this embarrassing problem: Proper foot hygiene, such as changing shoes and socks daily, can help. Also, natural treatments, such as a soothing tea bath rich in skin-drying tannins, can help control foot odor. 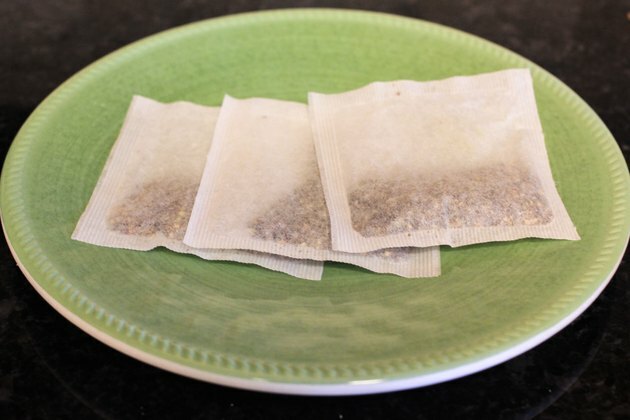 Boil three or four teabags in a quart of water for about 10 minutes, recommends "The Doctors Book of Home Remedies." Thoroughly wash your feet and dry them while the teabags are boiling. Let the tea mixture cool for 15 to 20 minutes, and then soak your feet in it for about 20 to 30 minutes. Remove your feet from the tea bath and dry them thoroughly. Do not rinse. Repeat this process twice a day until you no longer notice the foot odor. Continue to soak your feet in tea at least twice a week as a preventative measure. Don’t rely solely on a tea soak to control and prevent foot odor. Wash your socks, tights or stockings frequently. Use a cloth or paper towel dipped in alcohol to wipe out the inside of your shoes, and let them dry for 24 to 48 hours. Apply a foot powder after drying your feet for extra odor control, or glide an antiperspirant over the soles of your feet. Control sweat, which increases the bacterial activity that causes foot odor. Wear open-toed shoes as much as possible, and do not wear shoes with rubber or plastic materials. Consult your doctor before any type of foot bath if you have diabetes or a circulatory disorder. Do Teas Help Rid the Body of Fungus?